The grandeur of Africa is manifested in the beauty of the Murchison Falls Conservation Area. From the rolling savannah abundant with game to the resplendent waterfall born from the River Nile, Murchison Falls holds so many of those alluring features that call travellers to return. Immerse yourself in the treasures of the park and enjoy days of traversing the vast savannah, cruising down the Nile, and tracking chimpanzees in Budongo Forest. Upon arrival at the airport, you will be received by a concierge, who will whisk you away to your booked accommodation in Kampala, or Entebbe. Our journey to Murchison Falls National Park begins in the morning. We can’t resist stopping in at Ziwa Rhino Sanctuary to track and spot endangered Rhinos, the first of the Big Five of East Africa. We get the opportunity to track rhinos with experienced guides as a chef prepares a barbeque for us. We travel on and make our grand entry to Murchison Falls River Lodge. We tour the north of the park, which teems with buffalo, waterbucks, giraffes, hartebeests, and elephants grazing in the grasslands. The diverse wildlife keeps us alert, seeking out one fascinating creature after another. The lucky seeker might even spot the elusive, nocturnal leopard. After lunch, we set out on a launch trip to the base of the falls. 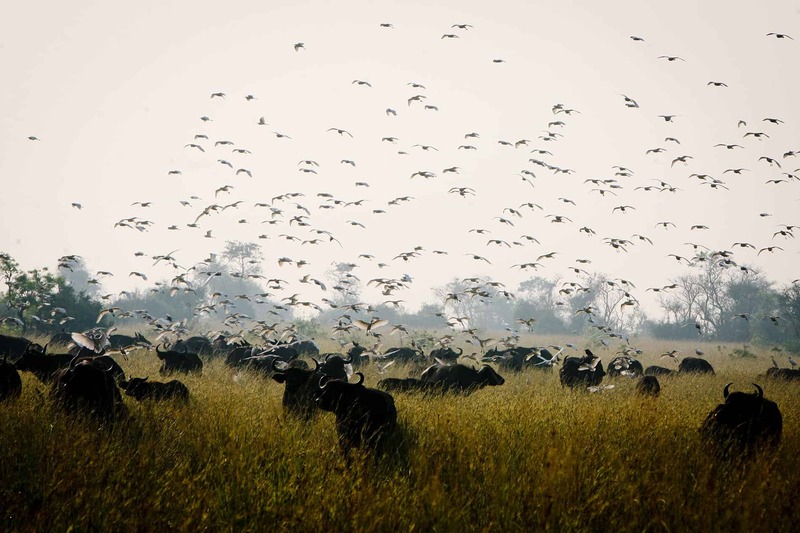 Buffalo, crocodiles, hippos, and a multitude of aquatic birds lounge at river banks. Birders are guaranteed to spot many of the 450 bird species at Murchison Falls, including the elusive shoebill, dwarf kingfisher, the white-thigh hornbill, and the Goliath Heron. From the base of the fall, we begin our hike, headed for the top. The peak awaits us with an unrivalled symphony of nature set to the crescendo of the waterfall. The thriving vegetation of Budongo Forest, just south of Murchison Falls, hosts 24 mammal species, over 360 bird species, 289 butterfly varieties and 465 plant species. This diverse forest is also home to a large primate population, including 800 chimpanzees. Today we set out into the forest to track chimpanzees, but stay alert for signs of black and white colobus monkeys, red tailed monkeys, baboons, and grey-cheeked mangabeys. At dusk we return to our lodge, savouring a spectacular foray into Budongo Forest. We journey back to Kampala/Entebbe, with a lunch-stop en-route. Note: Although we strongly recommend a hike to the top of the falls due to the amazing vantage points, it is optional, and you can instead drive to the top of the falls for viewing.